Are Wood Wall Treatments Right for Your Home? Homeowners and interior designers have been in love with gorgeous wood flooring for years, and we couldn’t agree more. But the rustic, textured appeal of wood isn’t just for floors! Among the many new and different style trends in residential design concepts, one of the most innovative approaches to a fully realized interior space is a wood wall treatment that really brings out the energy of a room. Designers are creating wood wall concepts in homes and offices made out of everything from thick oak planks and deconstructed pallets to faux-wood products and ceramic tile. Shiplap is also popular now as a wood wall treatment, made popular by a recent home rehab cable show. Log and timber frame homeowners have always been eager to stay ahead of the curve by choosing wood treatments inside the home rather than plaster or drywall. Choosing the right design element can add an elegant, tasteful touch along with character to the walls of a home or commercial space. Among the many beautiful exclusive brands we work with here at Mansion Hill, Wonderwall Studios excels at offering a variety of gorgeous wood wall panels for your home. They use exclusively salvaged wood for their products and employ local craftsmen at their Netherlands headquarters. Wonderwall wood paneling offers homeowners and decorators the chance to adorn walls and surfaces all over the home with just the right natural wood look. Inspired by the beauty of nature, DuChateau wood wall treatments offer a warm, rustic energy to any interior space. Their hardwood products are available in either standard Select Grade, with smooth uniformity for ease of application, and Aged Character grade which highlights the wood’s natural, free-forming grain patterns for a more authentic appeal. With a variety of designers in their stable, the DuChateau line offers impressive geometry and aesthetic appeal. 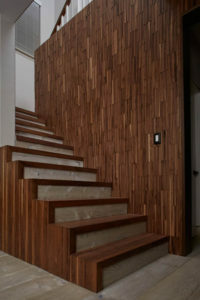 Offering a legacy of family craftsmanship from Brazil and a robust line of well designed, handmade hardwood products, IndusParquet continues to manufacture truly wonderful hardwood panels for flooring and wood wall treatments. Come into the showroom here at Mansion Hill and explore the many beautiful designs from IndusParquet. While these brands specialize in wall treatments, many types of wood flooring can actually be used as a wood wall treatment as well, especially most of the engineered hardwoods. If you’re interested in a tour of our showroom to see what Mansion Hill has to offer for your walls and floors, we’d love to show you around! If you’re looking to add some extra design flair to your home with creative wood wall treatments and custom flooring, look no further than Mansion Hill Custom Floors. Our expert staff can help you find the right materials to achieve the aesthetic appeal your home deserves.